If we want to colonize Mars in the future, it would be better for us to terraform the planet, in order to make the colonization process safer and sustainable. But, terraforming Mars will be a real challenge for humanity. Long story short, it’s still impossible to terraform Mars using existing technologies. We first resurrect its atmosphere and then warm it, but even if we nuke the poles of the planet as the SpaceX founder Elon Musk suggested, Mars simply does not retain enough carbon dioxide to mediate the greenhouse effect. In the video published by the “Nerd Nite” channel below, the presenter, Robert Lillis talks about why terraforming Mars will be “tough, reall tough”. Challenges of Resurrecting the Martian Atmosphere and Terraforming Mars. Mars’ atmosphere is dry, cold, and too thin to stop you from bursting like a balloon or getting cancer from cosmic rays. Eeeek, right? But billions of years ago it was thick, warm and (sometimes) wet. If humans want to live on Mars long-term, we need to find a way to resurrect the Martian atmosphere to its former glory. The presenter, Robert Lillis, will tell you where the ancient atmosphere went and what it will take to rebuild it. Spoiler: it’s gonna be tough. Real tough. Oh yes. Robert Lilis is a research physicist at the NASA-funded UC Berkeley Space Sciences Laboratory. He’s been a member of three Mars mission teams and has been studying Mars for 16 years. First of all, e must try to keep Earth a habitable place. We must slow down global warming and reverse it back, if possible. Green energy is great. But the Earth has limited resources, and even if we could find a way to implement huge recycling, they won’t last forever, especially the metals. So, we must find new resources, and that’s why the colonization of the other planets and moons is really important. Mars is a relatively close large planetary body. The minimum possible distance from the Earth to Mars is about 54.6 million kilometers (33.9 million miles). However, this has never happened in recorded history. The closest recorded approach of the two planets occurred in 2003 when they were only 56 million km (34.8 million miles) apart. The farthest apart they can be is about 401 million km (249 million miles). 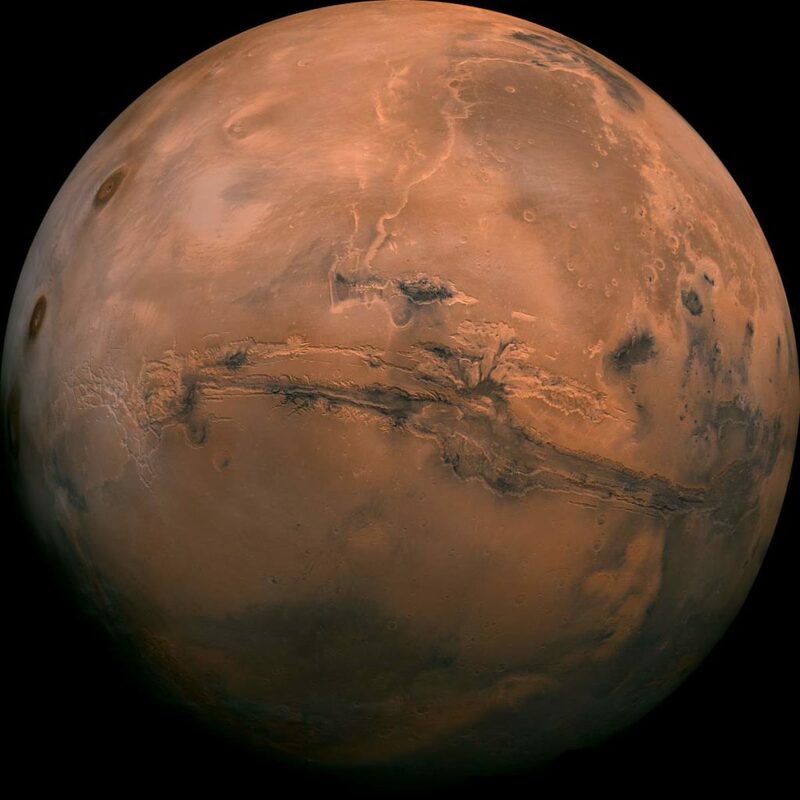 The average distance between Mars and Earth is about 225 million km (140 million miles). A sidereal Martian day is 24 hours, 37 minutes, and 22 seconds (on Earth, it is 23 hours, 56 minutes and 4.1 seconds). A solar Martian day (a sol) is 24 hours, 39 minutes, and 35 seconds (on Earth, 24 hours). So a Martian day is very similar in length to an Earth day. Mars has got a moderate gravity (3.711 m/s2). It is about 38 percent of Earth’s gravity, which is 9.807 m/s2. Compared to Earth, it’s much easier to launch a spacecraft to space from the surface of Mars. Mars has liquid water under its surface. Mars may contain ores that would be very useful to potential colonists. In the Martian meteorites which found on Earth, many important elements have been detected. Magnesium, Aluminium, Titanium, Iron, and Chromium are relatively common in them. In addition, lithium, cobalt, nickel, copper, zinc, niobium, molybdenum, lanthanum, europium, tungsten, and gold have been found in trace amounts. It is quite possible that in some places these materials may be concentrated enough to be mined economically. The Mars landers Viking I, Viking II, Pathfinder, Opportunity Rover, and Spirit Rover identified aluminum, iron, magnesium, and titanium in the Martian soil. Opportunity found small structures, named “blueberries” which were found to be rich in hematite, a major ore of iron. These blueberries could easily be gathered up and reduced to metallic iron that could be used to make steel. “Blueberries” (hematite spheres) on a rocky outcrop at Eagle Crater. Note the merged triplet in the upper left. In addition, both Spirit and Opportunity Rovers found nickel-iron meteorites sitting on the surface of Mars. These could also be used to produce steel. A less direct, but still remarkably important benefit: NASA is responsible for many other technological advancements that benefit people’s lives every day, including medicine, infrared ear thermometers, ventricular assist devices, and robotic artificial limbs, anti-icing systems, improved rubber tires that were adapted from space probes, fire-resistant reinforcement of steel, temper foam, and even portable cordless vacuums. All of these breakthroughs emerged because of the diligent and reliable efforts that are needed to manage the high stakes of the space program. With this, space organizations have always advanced science and technology simply because they needed to. 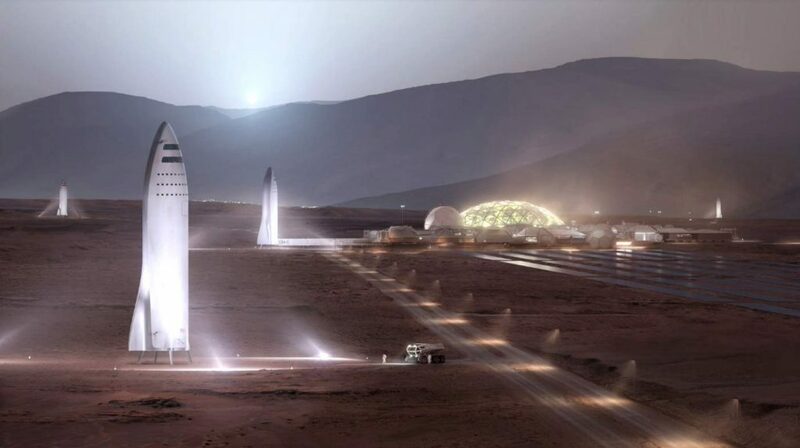 SpaceX planning to colonize Moon and Mars with giant reusable spaceships. Now the flip side of the coin. Establishing a colony and living on Mars brings many challenges and some of them are really hard to tackle. Some scientists think that Mars isn’t really the best place for humans to settle. They suggest that we should be looking somewhere else and colonize for example Titan, Saturn’s largest moon, instead – despite it is far, far away. The main problem with Mars is – radiation. The red planet offers no natural protection against solar radiation. It has a very thin atmosphere (its atmosphere is about 100 times thinner than Earth’s) and no magnetosphere. The surface of Mars is exposed to much higher levels of radiation than Earth. And in addition to regular exposure to cosmic rays and solar wind, it receives occasional lethal blasts that occur with strong solar flares. Prolonged exposure to radiation with levels detected on Mars could lead to all kinds of health problems, like acute radiation sickness, increased risk of cancer, genetic damage, and even death. So, humans who intend to spend any long period of time on Mars are probably going to have to live underground, or in some sort of devices that can shield them from radiation (we don’t have such devices yet). Mars dust is another huge problem. It is much finer than the dust on Earth, so it could easily find its way into the gears or electronics of our machines. It is also very dry, electrostatically charged because of that. It will stick everything, like spacesuits. So it would be impossible to avoid carrying Mars dust into Martian habitats – and even worse, into the crew’s lungs. Mars’ soil is filled with deadly perchlorate salts. Since Martian soil is alkaline and lacks the vital nitrogen compounds that plants need to grow, you can’t cultivate food on it. Mars’ lower gravity (38% percent that of Earth’s) can cause muscle-wasting, bone loss, and cardiovascular problems. There can be also psychological problems among the crew, after being stuck indoors in tight spaces without windows, with the same people, performing the same routines every single day, with little contact with the Earth, and a lot of things and dangers to worry about. Distance is another problem. Earth and Mars are separated by millions of kilometers, and orbital periods that leave only a narrow travel window every two years. Even communicating with the red planet takes minutes with the speed of light. If there’s an emergency in the Martian colony, Earth wouldn’t be able to help until the next travel window opens. How about terraforming Mars? If we could make it a place like Earth with geoengineering, the challenges of colonizing Mars would vanish. Today, Martian atmosphere is thin, dry, cold, and poisonous. But that was not always the case. Once Mars had a thicker atmosphere (not that tick, though, around 2%-5% of what the current Earth atmosphere is), but solar winds swept it over the course of the planet’s lifetime. Evidence suggests the possibility that Mars had large oceans a few billion years ago. Because of the low atmospheric pressure, if you pour some water on its surface, for example, it would quickly boil away. So, if we want to terraform Mars in the future, we should resurrect its atmosphere first. First, we must build a magnetosphere, otherwise, solar winds would sweep away the atmosphere we just built. But how can we do that? NASA Planetary Science Division Director Jim Green says launching a magnetic shield to a stable orbit between Mars and the Sun, called Mars L1Notes 1, could help warm Mars and possibly allow it to become habitable. Simulations showed that a shield of this sort would leave Mars in the relatively protected magnetotail of the magnetic field created by the object. Mars has frozen carbon dioxide (dry ice) in its poles. Heating the poles will sublimate some of it into the atmosphere. The sublimation will lead to a bit higher CO2 pressure which will lead a greenhouse effect, therefore higher temperatures, and even more sublimation. This process would release around 12-14 millibars of CO2, tripling the Martian atmosphere (currently it is 6 millibars, for comparison, Earth’s atmosphere is about 1,013 millibars at sea level). Where would we get that heat? One option is digging “moholes” – reinforced holes which 1 kilometer wide and km deep. It would be 300 °C (572 °F) in the bottom and the hole would release hot air continuously. It’s called mohole because it goes down to the Mohorovičić discontinuity, usually referred to as the Moho, the boundary between a planet’s crust and the mantle. Moho is named after Named after the pioneering Croatian seismologist Andrija Mohorovičić (23 January 1857 – 18 December 1936). Another option is installing fusion power plants at the poles which would slowly melt the dry ice. We could also put very big mirrors into Mars orbit. They could concentrate and reflect sunlight down to the surface. As explained above, melting the carbon dioxide at the poles of Mars would add around 12-14 millibars to the atmosphere. But we need much more than that. The problem is, it’s really hard to build the remaining part of the atmosphere. Every square meter of Earth’s atmosphere weighs about 10 tons. Mars has as much as the surface area as all of the Earth’s continents, around 144 trillion square meters. So we need dig up at least 10 tons of rock for each of this 144 trillion square meters on Mars, and find a way to turn this material into gas. Crustal rocks average three tons per cubic meter. So we need to dig an average of three meters over the whole planet just to get enough material. Then we have to melt this material and vaporize it. Carbon dioxide from the poles (1.5% of what we need) is a start. Additional 4% is absorbed in the regolith (the layer of unconsolidated solid material covering the bedrock of a planet or a moon), But we would need to dig the entire planet at least 100 meters deep to release it. A more realistic way would be to liberate oxygen, hydrogen, carbon, and nitrogen by vaporizing the rocks we dug up in step 4 and releasing it. In order to do so, we’d need a lot of energy. 1 ton of rock takes about 3 gigajoules of energy to vaporize. So, a big nuclear reactor (1 GW) can vaporize a ton every 3 seconds (or 10 million tons/year. But we are talking about 1,144 trillion tons of rocks here. So, we need more than 10,000 big nuclear reactors (approx. equal to Earth’s yearly electricity output) running for more than 10,000 years. Another problem is lack of nitrogen: carbon dioxide and oxygen exist in the Martian rocks, but there’s nut very much nitrogen on Mars. Remember, nitrogen constitutes 78% by volume of Earth’s atmosphere and is a constituent of all living tissues. Can’t we bombard Mars with comets? We know how to build nuclear plants and how to vaporize rock. But we still don’t know how to redirect comets. Let’s assume we could find a way in future. Resurrecting the Martian atmosphere with this method would still take a very, very long time. Most comets are slow, they have long orbital periods (hundreds of years). And we need a lot of comets. A comet weighs 1-100 billion tons. So we need to crash between 10,000 and 1 million of them into Mars. Mars has an average surface temperature of -63 °C (210 K; -81 °F). The average surface temperature on Earth is approximately 14°C (281 K; 57.2 °F ). So we need about 70 °C greenhouse effect. Despite being one of the main causes of global warming on Earth, carbon dioxide is not great for this job. Because, over around 100 millibars, its greenhouse effect actually diminishes. Plus, it is poisonous to humans. Methane (CH4) is 84 times more efficient than CO2, but we’d still too much of it to practically make use of it. Plus it is poisonous too. As explained above, the Martian soil is not cultivable. But, still, it seems some plants grew fine in the Martian simulated dirt. According to NASA, the soil on Mars actually does have the nutrients plants would need to survive on Mars. There may not be the right amount of nutrients depending on where astronauts land on the Red Planet though, so fertilizers may need to be added to the soil. The perchlorates in the soil would be leached out and separated from the water. NASA is currently developing a stimulant, a replication of Mars soil, to better understand how it can be used for plant growth and other purpose. But still a lot ow works to do. Before we can grow anything, we’ll have to decontaminate the soil which is difficult and expensive. Then, the soil can be fertilized using recycled biological waste. All of this will take a lot of time, money, and energy. All these geoengineering operations will need a lot of time, money and energy. Since the Martian atmosphere is very thin, wind energy is not an option. Mars receives much less solar energy than Earth, so solar panels are not very efficient on the red planet. Furthermore, this weakened sunlight is often obscured for days and even weeks by enormous dust storms (recently NASA has lost Opportunity rover after a huge dust storm blocked the sun, preventing the solar-powered rover from recharging its batteries). So, nuclear energy would be the best option – and hopefully, nuclear fusion will be available in the near future. It is always 50 years away, though. Since Mars doesn’t have easily accessible radioactive elements, the nuclear fuel needs to come from Earth along with reactors. Send humans to Mars and bring them back safely. Terraforming Mars needs so much work. Only people living there, probably born there, will actually care about it to do it. With our current level of technology, today it is definitely not achievable and it will be so for a very long time. More questions: will Martian society be stable/robust enough to grow to the kind of size needed to start rebuilding the atmosphere? What if they fight with each other? What if they rebel and fight against Earth? But, colonizing the red planet without terraforming it, is absolutely doable. At least in the near future (as explained above, it has many challenges too and probably it’s not a great idea). But, still, we should do it. Establishing a colony on Mars will be an extremely hard work that only a group of very determined, competent, and self-sacrificing people can do. Luckily, we have enough of these on Earth. In celestial mechanics, the Lagrangian points are positions in an orbital configuration of two large bodies where a small object affected only by gravity can maintain a stable position relative to the two large bodies. The Lagrange points mark positions where the combined gravitational pull of the two large masses provides precisely the centripetal force required to orbit with them. There are five such points, labeled L1 to L5, all in the orbital plane of the two large bodies. The first three are on the line connecting the two large bodies and the last two, L4 and L5, form an equilateral triangle with the two large bodies. The two latter points are stable, which implies that objects can orbit around them in a rotating coordinate system tied to the two large bodies. Several planets have minor planets near their L4 and L5 points (trojans) with respect to the Sun, with Jupiter in particular, having more than a million of these. 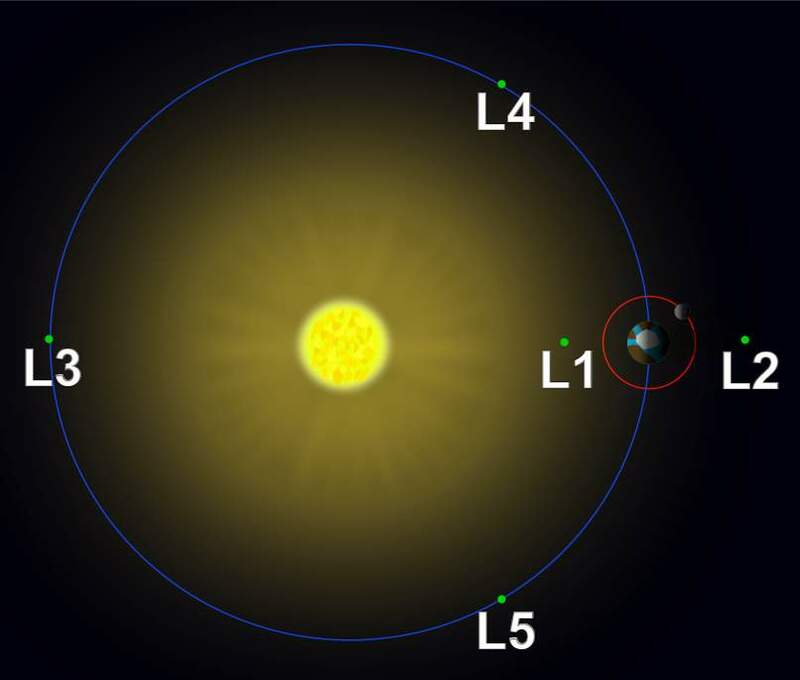 Artificial satellites have been placed at L1 and L2 with respect to the Sun and Earth, and Earth and the Moon for various purposes, and the Lagrangian points have been proposed for a variety of future uses in space exploration.